The 20ft high 'family tree' at Paul Barnett's home in Chidham, West Sussex is jam-packed with apples of all different shapes, colours and sizes. I’ve been able to get my trees back onto a yearly cycle. At least some of them. You’ll want to aggressively prune them the year they produce fruit. They get into the every other year cycle by overproducing one year, and the next year not having the energy to produce. You can sometimes break this cycle by keeping them from overproducing by pruning. Just be prepared for a huge amount of vegetal growth the next season, and again prune them way back. That apple tree is amazing... I read he's a horticulturist.... That figures well into the story.. I really like his cherry picking ladder too! If you really want to bake your noodle, pick up a copy of “the apple grower” by Michael Phillips. He can do things with apple trees that you can’t even imagine. 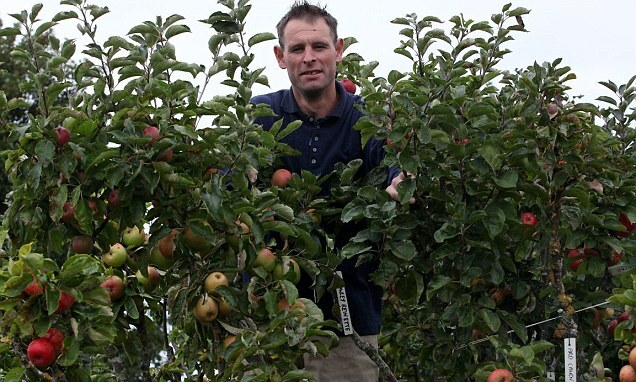 The guy is an apple whisperer. Don’t be afraid to abuse your apple trees a little - lack of pruning is what leads to the biannual cycle. And they respond well to pruning, once you have them tamed a little.